Elizabeth gave the wood turning gouge shown in the top banner to Jim for his birthday during 2006. 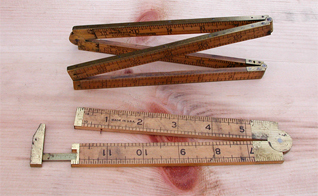 Jim has a few vintage woodworking tools. He enjoys woodturning and uses mostly vintage turning tools. While newer steel may hold a sharp cutting edge longer, he likes the feel of the older tools when working on his Jet Mini-Lathe. These tools may be lightweight for some projects on his larger Delta lathe. Jim especially enjoys turning pens and pencils on a small lathe. 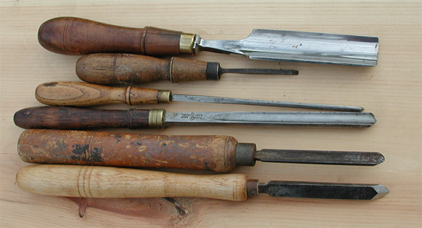 He generally uses only the three chisels shown below. 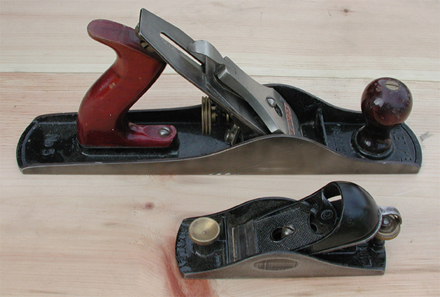 Jim regularly uses these two planes. They were used to fabricate molding for the restoration project in Byron, GA.